It’s always a bit of a disappointment when you can’t listen to your music in the car, especially if you have an old model like me and it still has a cassette player. Great for the old tapes, not so good for the more modern stuff I want to listen to. This is where the FM car transmitter comes in. Easy to use, and without the need for cables, it can connect to your mobile device and stereo to play your favourite tracks while you drive. 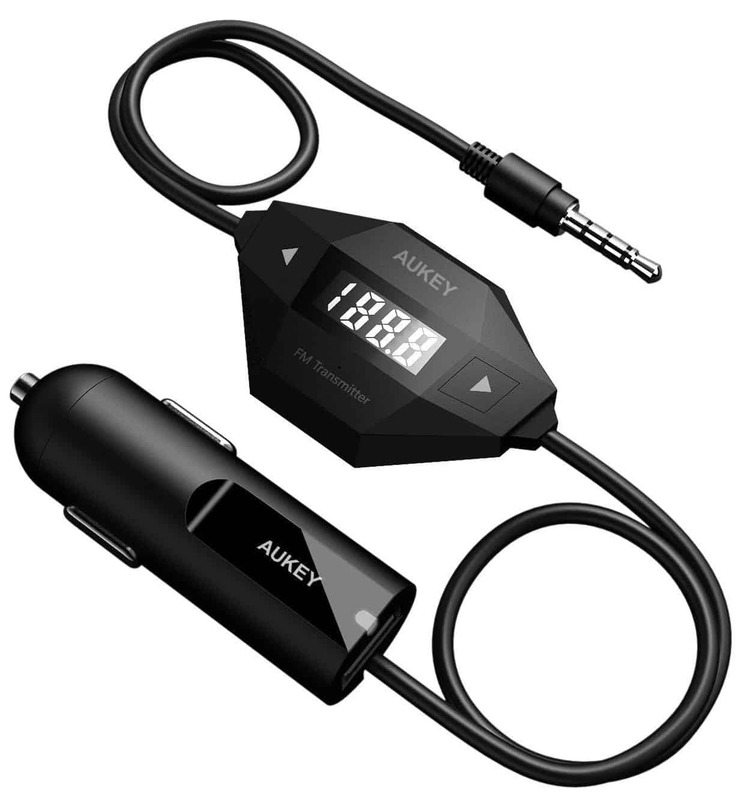 Take a look at our FM transmitter reviews and see for yourself. There’s actually quite a lot of choice on the market when it comes to selecting a transmitter for your car, and so it’s not always easy to make the decision. After all, you need to be thinking about things like placement and size. Will it sit nicely on the dash? Or do you need something tiny that will sit down by the gear box? This is the first question you should ask yourself before you make the purchase. 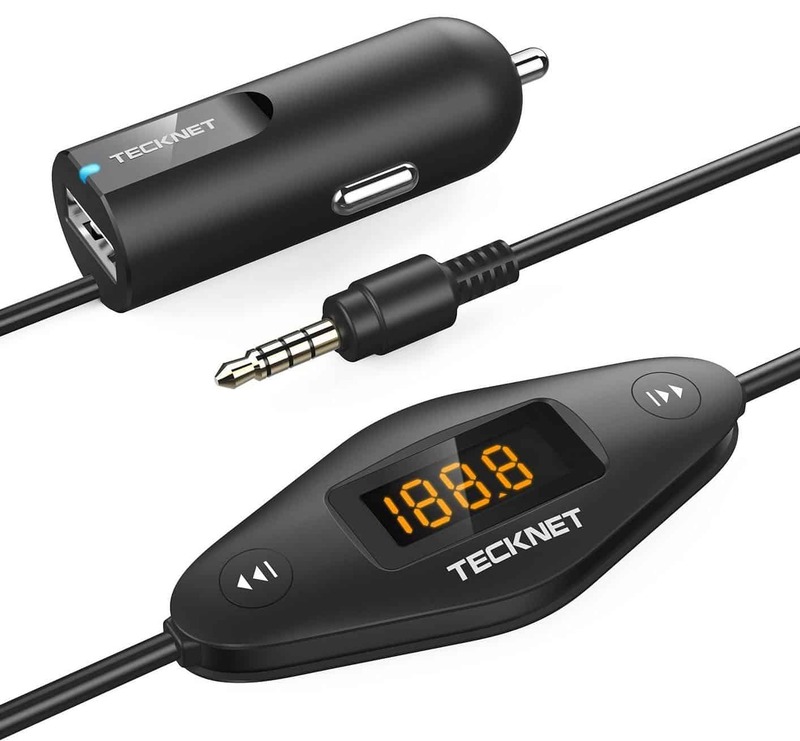 Some transmitters connect to your stereo via an AUX cable, and so if you don’t have one of these then you will want something that either works via Bluetooth and/or FM waves. These pick up the signal from your phone and transfer it to your stereo, allowing you to listen to your music without any irritating wires. Some have the AUX cable as an additional feature, in case you need a more stable connection. If you are going on long trips or your mobile device is not the best when it comes to holding charge, then it is often a good idea to purchase a transmitter that will charge your music playing device on the go. This way, you have charge in case of emergency, and you are also able to keep listening to your music without fear of the device battery running out. When looking for the best FM transmitter, something that offers hand free can be ideal for those who often get calls while they drive. Generally, the controls are very simple for minimum distraction, and many models come with noise cancelling software so that the people on the other end can hear you. It’s great for when you are on the go and provides you with a safe way of communicating. You can even see the caller ID on the screen. Make sure you check out the reviews for a product before you buy it, as the reviews can tell you a lot about a product. It’s a good idea to see what past customers think of the transmitter you are looking to buy, as well as any potential faults with it. This section becomes more detailed when we look at the individual products later on, especially as each has its own individual list of pros and cons. However, in this section we will go through some of the general advantages and disadvantages of an FM transmitter for your car. One of the big things to look for in a car transmitter is that it has a readable display at all times of day. This is so that you know what is playing, about any incoming calls, but also just to see basic information such as the time. Size is also quite important. If you don’t have much space on your dash, then it could be better to look at ones that are a little smaller and more compact so that they don’t take up so much space. If you are the kind of person that finds themselves in different cars frequently, it is worth picking up a mode that does not permanently connect to one vehicle. This way, you can use your FM car transmitter in any car you want with no hassle. There is only one way to really use an FM transmitter, and that is in your car listening to music with your friends, or even by yourself. Of course, it can also be used to charge your devices while you’re on the go and to pick up calls with the hands free technology that is built into it. These are great additional features that will really let you get value for your money. After all, using your phone and driving can be very dangerous (not to mention illegal in the UK), so a transmitter works as the middle man, creating a safer space for you to talk in. Place it on your dash or tuck it away and let the music experience take over. Make sure you read the instructions thoroughly before you use the transmitter. This is so you make sure you know how to set it up and about any additional features it may have. However, the first thing to do with one of these is to make sure it is compatible with your car’s power socket. Some can be a little tricky to put in and so it is important you try this out first. Once that’s done you can either continue or send it back and pick another. All that’s left is to choose the perfect one for you. 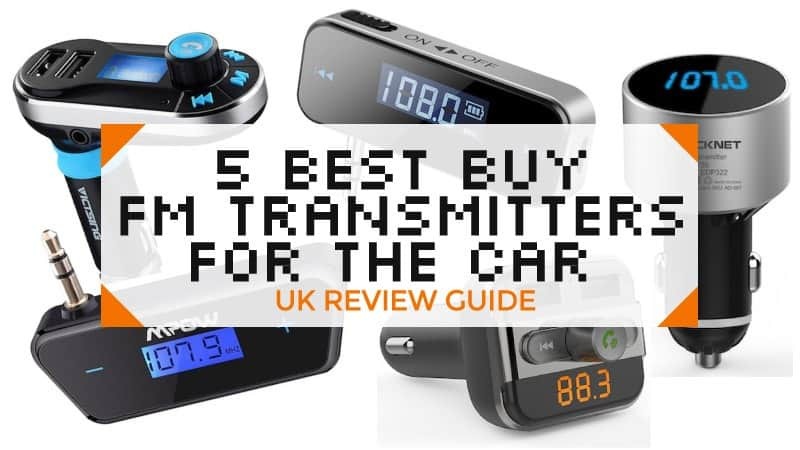 Take a look at our FM transmitter reviews for some of our favourite models. 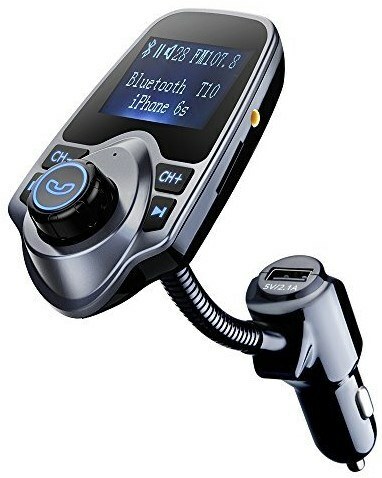 This Bluetooth FM transmitter works as a multifunctional device, transmitting audio files from your mobile device to the car radio in no time at all, as well as displaying incoming phone calls and displaying the car’s battery voltage. It has a capacity of 32GB and can play a huge range of music files. It has great sound calling and a clear display screen that is easy to read. It also incorporates hands free calling that can be set up with Bluetooth for safer call taking while on the road. It even keeps down the noise levels caused by the wind and surrounding traffic, for a better call experience. It even has an AUX port for your use. This is a great little FM car transmitter, and it works wonderfully at playing your favourite songs in the car. While calls can be a little tricky for the person on the other end, it all depends on the location you are in as well as its placement in the vehicle. It has a range of fantastic additional features that are sure to leave you feeling like you got a good bargain. A: It powers off when you remove your key. This model prides itself on the concept of music with no strings attached. It’s simple to set up and you will be listening to your favourite tunes in no time, with no complications, and it has no AUX port on it. Plus, if you find that your mobile devices need a little extra charge, this transmitter is happy to do that for you through its USB port. It can handle anything from smartphones to tablets. The LCD display is really easy to read in all kinds of light, so you know what it playing and going on at all times. The controls are simple and have easy accessibility, creating minimum distraction while you are on the road. At a highly affordable price, and with a two-year guarantee, this model is not one to miss. This MP3 FM trasmitter for the car is highly affordable, making it a bit of a steal. It’s very easy to set up and has a very compact build, making it easy to take with you as well as taking up as little space as possible in the car. It has a USB port for charging other devices, as well as controls that are easy to reach so you don’t end up distracted. With very few flaws, it’s a great value item. This nifty little transmitter sports an additional USB port so that you can charge your devices while you drive – meaning you never have to worry about low battery levels again. Pus, you can play all of your favourite music using the FM radio system and the stereo in your car. It’s easy listening with minimal hassle. You don’t need any permanent connections to a single vehicle, this device can go with you anywhere and anytime, streaming your music the whole time. It has a large LCD display panel so that you can view it quickly, and the controls simply consist of two buttons for complete operation. Affordable, and with good sound quality, it’s a great buy. Cheap, practical, and very compact, this is the ideal transmitter for those who want something reliable and that doesn’t take up a great deal of space. It is easy to set up and has simple controls, so you don’t end up distracted while you are on the road. Plus, the charging cable is long enough that even backseat passengers can have the chance to charge their devices, so no road trip leaves anyone feeling bored. Great value for money. This Bluetooth transmitter for your car sports a sleek design and quick Bluetooth paring for easy music streaming in your vehicle. It has a USB port for easy connectivity, and is compatible with a range of devices, from smartphones to your PC. Plus, it has four playing modes for an even better experience. The USB charging port means that your device never have to run flat and die again, simply plug it in and let the transmitter do the work. In addition to this, it has great sound quality and can be used for hands free calling with noise cancellation for the background. The large LCD screen is easy to read, displaying incoming calls, car battery voltage, the volume, and the song you are currently playing. It’s easy to read no matter the time of day. 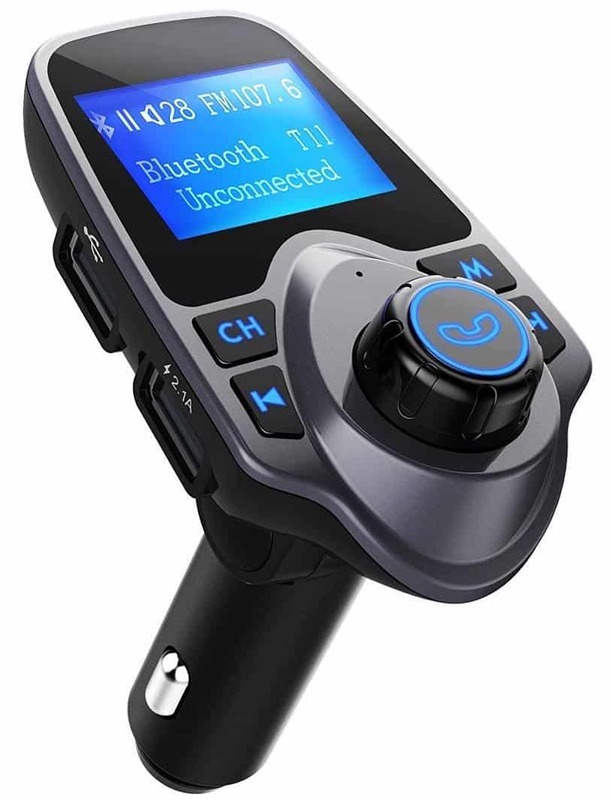 This Bluetooth radio transmitter could be the best FM transmitter for iPhone 5, 6, and 7, as it has wide compatibility and is easy to connect to your devices. It is even able to charge them while you are on the go. With a sleek look and easy placement in your vehicle, it’s amazing how cheap this particular transmitter is. Once you go with one of these you are unlikely to go back. "Works perfectly and fantastic value!" - By Nick H.
This Bluetooth radio transmitter has broad compatibility and pairs quickly with your device for easy music streaming. It will charge your devices quickly, adapting its power levels according to the device it is charging. It plays a variety of music files, and has a capacity of 32GB, so you can store a lot of music for those extra-long road trips. It has hands free calling with noise cancellation while you are on the phone, for a clearer conversation and minimal distraction. It has a large LCD display screen that shows you a range of important pieces of information – everything from caller ID to the car battery voltage. It’s multifunctional, affordable, and works superbly. This is a great transmitter for those who want something affordable and reliable. While it may have a couple of niggles, this car transmitter is fantastic value for money, with broad compatibility and a fantastic 32GB of memory. No matter how long your drive, you are sure to have enough music to keep you entertained. Plus, it will even charge your devices, so you don’t need to worry about a low battery interfering with your tunes. Good quality, low price. It’s tough to decide which car transmitter you want. However, the best FM transmitter for the car has to be the VicTsing. It has a wide range of useful features, including Bluetooth compatibility and the ability to take calls hands free in your car. It has everything you need from a transmitter, as well as the things that you should be looking for. These include extras such as USB charging, a clear, large LCD screen, and the ability to block out background noise while you are talking. It affordable, reliable, and an absolute must for those who like to listen to their favourite songs while on the road. So if you are looking for a UK car transmitter, this might just be the model for you. What did you think of our FM car transmitter selection? Are there any you would have added? We love hearing from you, so feel free to leave a message in the comments below.